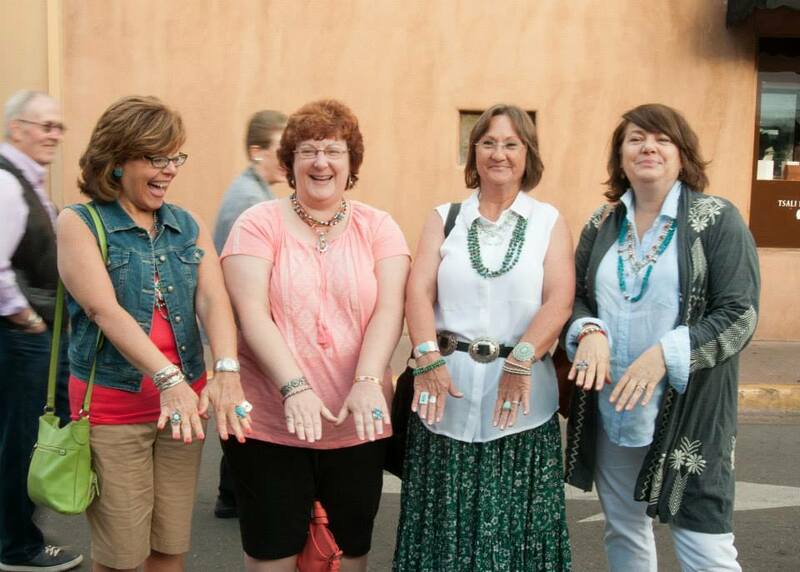 Pictured, left to right: Wendy Cesca, Sara Davidson, Kathy Vigil, and Sue Sassin at the Santa Fe Indian Market 2014. So you and your group of ladies are looking for a destination to hold a girls weekend? Come to historic Santa Fe! You will find oodles of information on where to go and what to do, but here are some tips from a local. Drink plenty of water – you are at 7,000 feet and it’s as dry as they say it is. Wear comfortable shoes – you will do a lot of walking, with beauty and historic charm around every corner, but it takes its toll on your feet. Allow time to just wander – keep your camera handy, breathe in the scent of pinon, and who knows you might even end up on a movie set! On your way into town, don’t miss our Carolyn Pollack gallery in the Santa Fe Outlet Mall. We will outfit you beautifully with gorgeous one-of-a kind treasures, retired collection pieces, and the iconic native pearl necklaces, all must-haves in Santa Fe! Not sure where to stay? We can recommend the Inn @ Santa Fe, which is located just across our parking lot. Leave your car parked at the hotel and let your shuttle driver navigate the plaza for you! We like to start our day on the plaza early, with blue corn pancakes at the Burrito Co. on Washington Ave. They have plenty of outdoor seating, so you can take part in another of Santa Fe’s favorite pastimes – people watching! Grab a plaza map and plan out your day as you soak up the endless sunshine. At the end of your day on the plaza, relax on the patio at the St. Francis hotel. They have comfortable seating and you can enjoy a drink and a taste of local flavor in comfy surroundings – the perfect end to a full day. For the past 10 years, my daughter, our husband, and I have been coming to Indian Market. We are also avid AVC buyers. This year we can’t come, my granddaughter is have twins about the same time. We love your jewelry, and the Native American jewelry. We’ll come next year and catch up.